Spain’s biggest bank is merging its asset management arm with that of UniCredit, with private equity help. Both lenders gain from meshing cash-generative, capital-light businesses. But Santander does so without adding scale in the United States – where it still faces big regulatory hurdles. 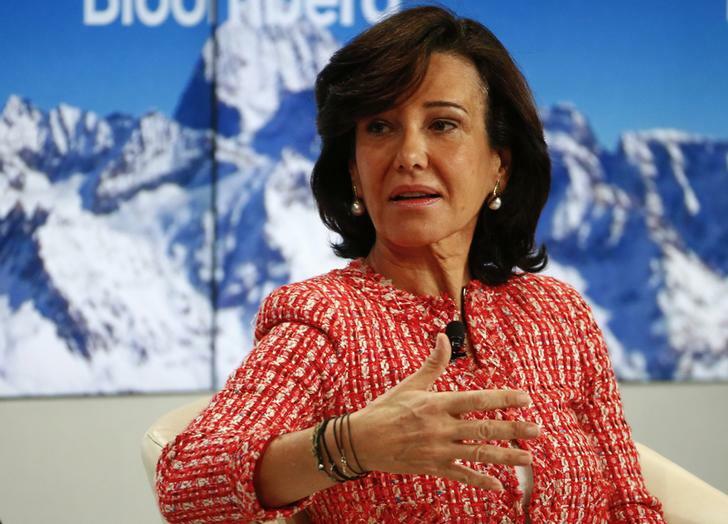 Ana Botin, Chairman of Banco Santander, gestures at the Ending the Experiment event in the Swiss mountain resort of Davos January 22, 2015. Spain’s Banco Santander and Italy’s UniCredit reached a preliminary agreement on April 23 to combine their asset management arms in a deal which values the new company at 5.4 billion euros, with about 400 billion euros in assets under management. Under the terms, UniCredit and private equity sponsors Warburg Pincus and General Atlantic will each take a 50 percent stake in a new holding company. The sponsors already own half of Santander’s asset management business. The holding company will own Pioneer’s U.S. operations, plus 66.7 percent of the rest of the combined operations. Santander will own the remaining 33.3 percent directly. The new company will be called Pioneer Investments and agreement is based on an enterprise value of 2.75 billion euros for UniCredit’s business and 2.6 billion euros for Santander Asset Management. The Spanish bank said the deal wouldn’t have a material impact on capital, while UniCredit said it would add 25 basis points to its core capital.